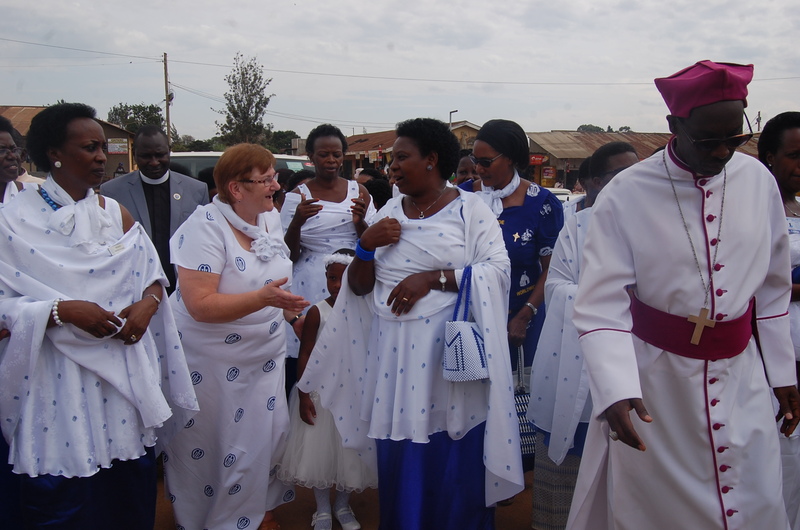 MBARARA – The head of the World Mothers Union, an association of women in the Anglican Church, has urged women in Uganda to protect the families, which she said are being threatened by many global challenges. Ms Lynne Tembey, who hails from Britain, said family stability in this era of globalization is very important for development. “As mothers, you hold a critical role in ensuring stable families, stable families are the foundation of the church of Christ and social economic transformation. You have also to be mindful of the wellbeing of these families through economic empowerment. I am impressed by what mothers union in Uganda is doing so far,” said Ms Tembey on Friday while meeting mother’s union leaders at the headquarters of Ankole Diocese in Ruharo, Mbarara Municipality. She added that the current family problems are the same worldwide and urged the mothers to trust God for solutions. “I might be white and you black but we all follow one God and the challenges we face and opportunities we look for are the same as children of God. So we need to come together as a united force; God’s purpose for man is upheld here on earth,” Ms Tembey added. Church of Uganda Mothers Union president Dr Ruth Ssenyonyi urged women to put God first in all they do if they are to be successful. “Families are failing and ripped apart because man and you women especially have chosen to fight your own battles, you get married in church spend years without a child you go to consult witch doctors and when deliver you say God has done it; you take your eyes off God and trust in man who God created, this is cause of increased suffering among people,” said Dr Ssenyonyi. Dr Alice Mwesigwa, the Mothers Union President for Western region said women remain committed to working for unity, women economic emancipation and strengthened families. The Bishop of Ankole Diocese Rt. Rev Fred Mwesigwa said without women churches in Uganda would be closed. He hailed Mothers Union for supporting the church projects and survival of families. “There is a big gap of men in church; without women in church, churches in Uganda would be closed and we appreciate women have not only stopped at the physical presence in church but are also key in supporting church projects and families,” Bishop Mwesigwa said. She toured the Shs.6billion Mothers Union Family Complex under construction at Ankole diocese. The facility will be a youth and women skills training centre.